I was reading about Saint Matthias and was struck by how little we know about this disciple. Since he was chosen to replace Judas he falls in a an odd place in the New Testament. He was not one of the 12 during his ministry, though he had apparently been one of the people who followed Jesus during his ministry. We can infer, then, that he and Joseph (called Barsabas) were both trusted followers as they were both nominated to become disciples. It is interesting that the custom of drawing lots did not 'take' as the way to select the leaders of the church. This is a recorded instance of someone being elevated to a leadership role but did not evolve into a tradition like many other things in the church. That is a side issue to my main thought. I have observed the culture wars that revolve around the interpretation of the bible and the desire some people have to treat the bible as the literal word of God. I reject that. In my experience, the bible is a lot more like a family scrapbook. Such a book can contain news clippings (especially birth and death notices), photographs of family and friends, prize ribbons, programs from professional concerts and plays, ditto sheets of children's recitals and other flat (or pressed flat) memorabilia. The stories in the bible are like the ephemera those of us over a certain age we keep in scrapbooks (the younger generation might wind up with digitized collections of similar items). Each photograph, poem, or flower represents a story that the person who assembled the scrapbook wanted to remember. Each story in the bible from Adam to Zaccheaus, from Eve to Priscilla from Israel to Carthage is a snapshot that the various people who compiled and edited the various books in the bible wanted to keep so it would be remembered. However, like a scrapbook the stories get muddled, changed and reinterpreted with each generation that inherits them. A personal example from my own life: My great-great-great grandmother Susan was born in Scotland. Her daughter, Jemima emigrated to the US with her family in the 1880's. Her daughter Annie married and had 4 children, one of whom was my own grandmother, who always hinted that our family was some sort of landed gentry that had to leave Scotland. Part of this was driven by her own grandmother Jemima's perception of Americans as unwashed and uneducated. The family had benefited from excelling schooling that was avalalbe to Scots. (Fun fact, the Scots as people had a higher literacy rate than their English neighbors of the same time period.) The fact that her daughter, Annie, probably didn't have anything to say about being forced to move to America, likely encoraged a longing for civilization (Scotland) in both mother and daughter. 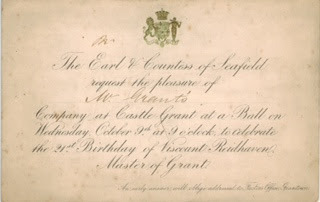 While I was going through my family's history documents, I found a invitation to a 21st birthday ball for the son of the local lord. This may have added fuel my grandmother's romantic version of our family history. The reality, as far as I have been able to work out was quite different. Jemima listed her mother and her father on her own marriage license, but not only is there no record of Susan's marriage, she lived with her own mother for much of her life and she, her mother and Jemima are all on the census together without a man in sight. My best guess is that Susan and Jemima's father never married. He died with Jemima was a child and was listed as living with his brother. About 10 years after Jemima was born, Susan had another daughter. That daughter had a son who emigrated to the US with Jemima's family. The entire family worked in Scotland. Jemima was a 'jute weaver' her husband was a 'slater' (roofer). The house where the family lived was owned by the mills and when the mills closed the jobs dried up. My family were, like so many others, economic refugees. I don't know how much of my own grandmothers stories came from her parents, how many were driven by the pressures to be of 'good class and breeding' when she was growing up in the 1910-1920's. I do know that my grandmother was status conscious all her life. She worried about what other people would think. Being ladylike and having good manners were very important to her. All of that, combined with lack of easy access to historical documents, informed her own interpretation of her family history. I took that same fragments of information that she had and made them into a different story. One that comes just as much from my on biases and romantic notions of the past as hers did. For me, the bible is like that: fragments of family stories that we each pick up, investigate to the limit of our interest and ability, and re-tell to our own family with our own spin on the story. My own line of stories runs through Isabella, Susan, Jemima, Annie, Dorothy, Ann, and finally me. The stories that I tell about these women and their families, like the stories I tell about the people in the bible are informed by my history, education, and culture. The people who come after me will carry a bit of my interpretation with them, but will go on to create their own. That is what makes history live. The stories we tell. I will never know if Annie wanted to come to the United States in 1880 or if she resented leaving Scotland for the rest of her life. I will never know if Susan wanted to marry Jemima's father and couldn't, or if she never wanted to see him again, but I can tell myself stories based on the fragments that remain. That is what give us a personal connection to the faith-- seeing our own life and experience in the fragments of stories our ancestors-by-faith thought were important enough to pass down to us. We give them new life with our own breath. Matthias, who ever he really was, lives on in the story of Jesus that was left for us by the church's early scrap-bookers. There is no 'one right way' in storytelling. The only wrong way is to stop telling the story. This essay was originally published at The Episcopal Cafe on 24 February 2017.